Extict cave bear DNA has been found in today's modern bears. This is a fascinating article about how alvarezsaurs evolved. It looks like part of the Dakotaraptor skeleton came from a turtle. That one hadrosaur skeleton from Hokkaido, Japan has been cleaned and in 60% complete. It's also the largest dinosaur skeleton ever found in Japan. 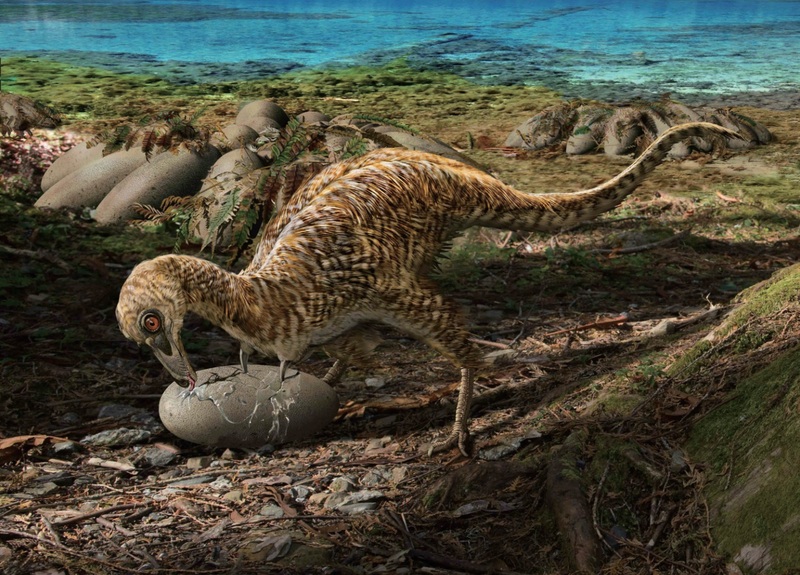 A new member of the iguanodont family has been found in the Gobi Desert in Mongolia. It's name is Choyrodon barsboldi. We may finally know what dinosaur DNA really looks like. A new species of Alvarezsaurid Dinosaur has been found in Central China in a Late Cretaceous formation. It's name is Qiupanykus zhangi. Research has shown that it most likely ate dinosaur eggs. A discovery in Jordan shows that mosasaurs had tails like sharks do. This means that they were more then able to catch fast prey. A new bird found in the Hebei province of Northeastern China has been found and named Jinguofortis perplexus. It lived 127 mya and had a mix of bird and dinosaur features. A species of elephant bird, Vorombe Titan, has been declared the largest bird to have ever lived. A new 9-10 meter (27-33 foot) long tyrannosaur has been found in New Mexico and has been described as Dynamoterror dynastes. First there is those 2 specimens of T. rex, then Bistahieversor, and now this new one, Dynamoterror. New Mexico has been a very happy surprise when it comes to tyrannosaur fossils. Fossil skull of a young Diplodocus has been found, described, and named Andrew. An 85 year old baby Tylosaurus fossil shows that mosasaurs may have lived like orcas. It looks like the elongated feet of T. rex and other large theropods helped them hunt prey because the shape helped tone down the noise when they where walking. A well preserved 120 million year old bird from China, Archaeorhynchus spathula, not only had it's feathers preserved, but also one of it's lungs. Amphicoelias fragillimus has been re-described as Maraapunisaurus fragillimus, a Rebbachisaurid sauropod. A 70 million year old has been found in the Gobi Desert by Japanese and Mongolian paleontologists. All the skull bones of the Tufts-Love T. rex have been accounted for. In related news, T. rex could bite with a force of 34,000 newtons. A new species of Archaeopteryx has been named and described as Archaeopteryx albersdoerferi. A new species of the Maimenchisaur family found in Middle Jurassic era formation in the Anhui Province of China has been named and described as Anhuilong diboensis. A new species of Azhdarchid pterosaur (think Quetzalcoatlus) found in Late Cretaceous formation era strata in France has been named and described as Mistralazhdarcho maggii. Pierre Lavaud made this illustration. A 110 million year old sauropod found in Argentina has been named and described as Lavocatisaurus agrioensis. It looks like tyrannosaurs were quite maneuverable. The early tyrannosaur, Dilong had an S-shaped brain. This actually helped its agility and balance. Tiny raptor tracks made by raptors the size of sparrows were found in South Korea. A new Abeilsaur found in Brazil has been named and described as Thanos simonattoi. Somebody has been seeing a lot of Avengers: Infinity War lately. A toe bone of an ornithopod dinosaur has been found in Oregon. The remains of a 200 million year old dicynodont has been found in Southern Poland has been named and described as Lisowicia bojani. This one is huge. The size is comparable to that of an elephant. Here's a pretty detailed paper about a headless, but otherwise complete Stegosaurus skeleton. Notable for being pretty much the last huge mammal until the Eocone right? Fossilized ichthyosaur blubber has been found and proves that ichthyosaurs were warm blooded. A Triceratops skull was found with a skin fragment attached to it. A new 130 million year old titanosaur found in Russia has been named Volgatitan. It was just 17 tons, so it's one of the smaller ones.